Demantoid Garnet is the rarest of all the garnet varieties, and is valued by collectors for its exceptional brilliance and fire. The rarest and most valuable demantoid comes from Russia, and for serious gem investors only the Russian material is worth notice. Demantoid belongs to the andradite variety of garnet, and is a calcium iron silicate by chemical composition. It has an unusually high refractive index, higher than ruby and sapphire, and this is one of the reasons for its impressive brilliance. But demantoid garnet also has remarkable dispersion or fire, the ability to split white light into the all the colors of the spectrum. In fact demantoid has a higher dispersion rating than diamond. Russian demantoid has been mined at 3 locations in the Ural Mountains: Klodovka, Karkodino and Babrovka. The quality varies between the different locations. The Karkodino mine produces highly saturated greens but with a very dark tone. Most of the Karkodino material is heated to lighten the color. The material from the Klodovka and Babrovka mines is usually unheated and the Babrovka material is noted for its excellent fire. Though demantoid garnet has been found in other locations, notably Namibia and Madagascar, the quality of the top Russian material is far superior. The African demantoid tends be yellowish green, olive green or brownish, due to higher concentrations of iron. The Russian demantoid is colored by chromium and tends to be a pure vivid green. Since the Russian demantoid is so rare and valuable, a distinguishing feature of these gems has become known to every gem collector. Internally the Russian stones display fine needles in a radiating pattern that has become known in the trade as a horsetail inclusion. Only the Russian demantoid display this unique feature, which is prized by collectors. 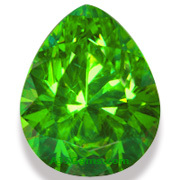 Demantoid garnet is found mainly in small sizes, with most stones under 1 carat. Gems over 2 carats are considered extremely rare, and market prices reflect that. 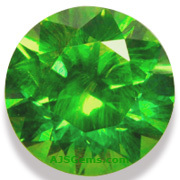 Among the rare garnets, fine demantoid is substantially more valuable than tsavorite or spessartite.